Why do schools have admissions departments when they’re really in the rejections business? Christopher Buckley presents the most god-awful rejection letters ever sent—and some pretty famous dropouts. Why do schools have admissions departments when they’re really in the rejections business? Christopher Buckley presents the most godawful rejection letters ever sent—and some pretty famous dropouts. As someone who has received his fair share of rejection letters over the years, let me extend a collegial hug to the many fine, talented, but clearly brain-challenged high-school students who will be receiving college rejection letters this spring. Before you post a comment calling me a supercilious twit: The sentence above was designed to run the gamut of rejection letter types, from We’re so, so very sorry to Take a hike, idiot. In between those two extremes is the inevitable foul-up. This year’s classic Oops award goes to the University of California at San Diego, whose admissions department (by the way, why do they call them “admissions” departments when they’re really more in the “rejections” business?) sent out an email to 47,000 high-school seniors, congratulating them on being admitted. The only problem was that 28,000 of them had been rejected earlier in the month. The “admissions” director quite properly accepted all responsibility but, in a clear ethical lapse, did not publicly disembowel herself on the front quad. Congratulations on 987-65-4321’s admission to Arizona State University! We commend you for the significant role that you have played in helping him to prepare for this exciting and critically important time. ASU is committed to providing an outstanding collegiate experience, and we are pleased that he has chosen to take advantage of this tremendous opportunity. We are fully prepared to assist 987-65-4321 in making a successful transition from high school to college. Thank you for offering our son, 987-65-4321, or as we affectionately refer to him around the house, 987, a position in the ASU class of 2003. His mother, 123-45-6MOM, and I are very happy that such a prestigious institution of higher education such as ASU has extended this offer. In selecting a college for 987, we are looking for a place that will prepare him for the technological challenges of the 21st century. Having reviewed the many rejection letters I have received in the last few weeks, it is with great regret that I must inform you I am unable to accept your rejection at this time. This year, after applying to a great many colleges and universities, I received an especially fine crop of rejection letters. Unfortunately, the number of rejections that I can accept is limited. All I can say is, any “admissions” department who’d turn down someone who could write a letter like that is in the wrong business. If you ask people of my generation (I’m 56—the grave yawns), I suspect many of them would tell you what I would certainly tell you, namely that we wouldn’t stand a chance, by today’s standards, of getting into the colleges that accepted us back then. This is not false modesty. One…weeps to hear the stories. The “admissions” director of Yale some years ago candidly admitted that it could fill three incoming freshman classes with more or less identically qualified applicants. Seeking consolation for those of you who will endure these god-awful letters this spring, I went to a site called—literally enough—collegedropoutshalloffame.com. There’s no better solace than learning who, among the rich and famous, flunked out, dropped out, or never went at all. The good news is that there are hundreds of names on it. More. As the late Carl Sagan would say, billions upon billions…. Edward Albee, playwright. Trinity College, three semesters. Kevin Bacon. Dropped out of high school. Come to think of it, didn’t he play the really smart, screw-up kid in the movie Diner? The one who knows all the answers on Jeopardy? Also, come to think of it, wasn’t he a Bernard Madoff victim? Hmm. Warren Beatty. Northwestern, one semester. It just goes to show that a college dropout can score a babe like Annette Bening. Carl Bernstein. His fellow reporter Bob Woodward went to Yale. Is there a moral here? Yogi Berra. The most quotable American philosopher in history! James Cameron, he of Titantic and Terminator. QED. George Carlin, the smartest comedian since Lenny Bruce. Andrew Carnegie. Went on to become one of the richest human beings on the planet and endowed more than 300 public libraries. Scott Carpenter, the Mercury astronaut. Whoa—an astronaut? Are astronauts supposed to flunk out? He missed the final exam at the University of Colorado at Boulder on heat transfer. Dude! As I say, billions upon billions—or as Timothy Geithner (Darmouth, non-dropout) would say, trillions upon trillions, but why don’t we just stop at Winston Churchill, who never attended a day of college and managed to win World War II. With a little help from a Harvard man. If your terrific, wonderful, deserving kids get one of these “he’s a deny” letter or another on the theme of “go away and stop wasting our precious time,” steer them to the college dropout hall of fame. It will give them the audacity of hope. Audacity of hope…say, isn’t that the title of a book by that guy who started out at Occidental, transferred to Columbia and finished up Law Review at Harvard? Christopher Buckley’s books include Supreme Courtship, The White House Mess, Thank You for Smoking, Little Green Men, and Florence of Arabia. He was chief speechwriter for Vice President George H.W. 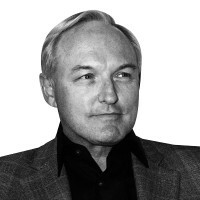 Bush, and is editor-at-large of ForbesLife magazine.